Immediately they knew, that they had to create an own project together, so they started to exchange ideas, datas, knowledge and music from their groups. fata-fata konsequent ihre gemeinsamen Improvisationen. 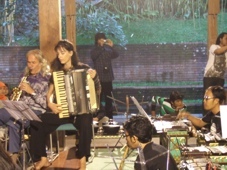 In april 2011 they all met again and created an exciting performance with new compositions by the leaders of the groups. 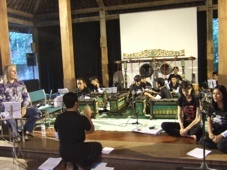 So the gamelan will appear in a contemporary style, playing scores with a conductor as well as in the traditional way. 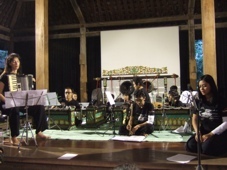 The main idea for the fata-fata-project ist to combine western instruments with the traditional gamelan on the one hand. 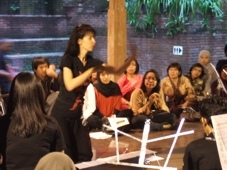 On the other hand the new idea is to combine pelog and slendro within the gamelan itself, which is a new idea and not used until now. So it needed to invent an new way of writing for the compositions. The musically research of duo fatale has gained the result of doing this. One of the small revolutions is that one person has to play two instruments at the same time, which needs a new arrangement of the instruments. The next step are new playing technics which are needed in the new compositions, which all of them have to find out, like how to play three notes at the same time with only one stick in one hand and a distance of half a meter? 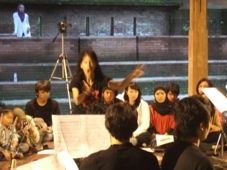 So the whole project is a huge challenge and experiment of finding new ways of playing wonderful ideas and realizing a sensational experience for the audience, which has been proved at the beautiful first fata-fata-concert at the Selasar Sunaryo in Bandung in april 2011. 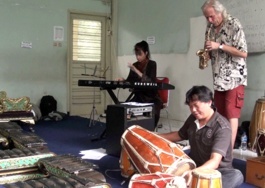 In march 2012 they have continued their common work in Bandung and enrichened the music with further concepts, free improvisations and more compositions. JOPO & Ingeborg Poffet from Switzerland are known as the Duo fatale, worldwide playing concerts on international festivals, clubconcerts and for filmmusic-studios. 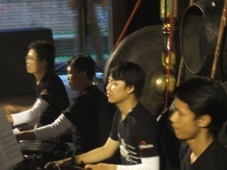 They work with electronic, realize computer-music as well as they are producers and sound-engineers, always inventing new projects and creating new formations, collaborations, compositions, concepts and multi-media-events. They have published many cds & dvds, mostly on XOPF-Records, and sheets- and book-projects on AUGEMUS-Musikverlag & Verlag POFFETmusic.ch. 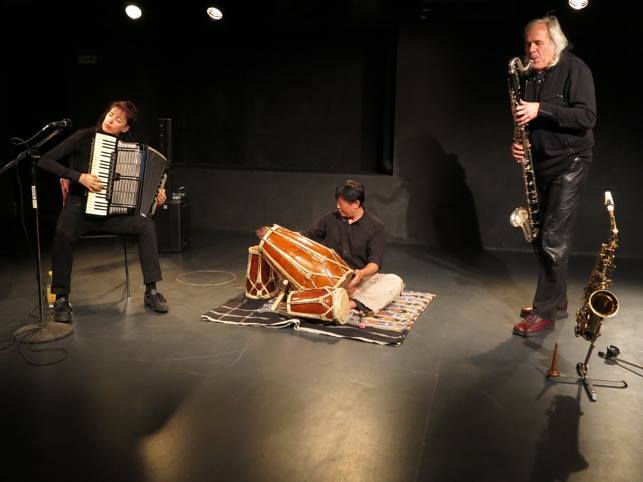 They have worked projects with indian musicians (JAISH, Indian Book), turkish (El JIM V.), chinese/malaysian (SOULS in LOVE), marrocain musicians (Aisha Fatalisha), russian and others (Duo fatale meets international guests).